Butchers are being urged to register for point-of-sale kits following the success of the AHDB Pork Achieve Lazy campaign last May and June. The campaign demonstrated the ease and simplicity of pulled pork, and the point-of-sales kits are hoped to benefit when the campaign returns to air next month. 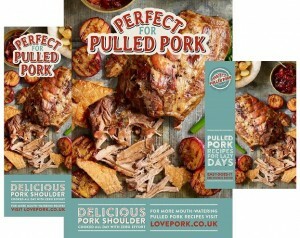 The kits, which are free, are packed full of eye-catching material, including pulled pork recipe booklets, posters and window vinyls; all of which feature dish imagery to tempt customers into giving pork a try. The TV advertising campaign, which begins on 10th February and will run until mid-March before returning in April, will be supported by PR, social media and in-store activity. Six new recipe ideas have been developed and include dishes with Valentine’s Day and Mothering Sunday in mind. A recipe using a slow cooker has also been included, as have serving suggestions for left-over pulled pork. Keith Fisher, AHDB Pork butchery development manager, said: “It is important butchers are able to join in with our promotional activity and benefit accordingly, and the kits enable them to do just that. Last year, kit requests reached a record high. More than 2,200 independent butchers ordered and used the pulled pork display material and, in a post-campaign survey, 80% said demand for pork shoulder joints during the campaign period increased – with half of all respondents recording a 10-25% sales uplift.